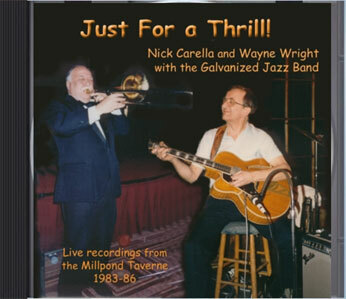 Just For a Thrill (GJB 9/18/83) is another treasure from the archives featuring Nick Carella, Wayne Wright, and Noel Kaletsky. Between 1971 and 1996 we performed almost every Sunday evening at the Millpond Taverne, with different guest artists every week. One of the most unique of those guests was Nick Carella. A seasoned veteran of big bands and small combos, Nick had worked with Louis Prima, Les Brown, Joe Marsala, Adele Girard, Marty and Teddy Napoleon, Billy Butterfield, Wild Bill Davison, and Roy Eldridge. On several evenings with Nick between 1983 and 1986 our music was further enhanced by the presence of Wayne Wright and his marvelous left-handed guitar. Primarily self-taught, this master rhythm guitarist got his feet wet with the likes of Elvin Jones, Donald Byrd, Pepper Adams and Barry Harris. He worked with Peggy Lee for seven years, and was also the rhythm guitarist for Judy Garland, Tony Bennett, Les Paul and a host of others. He was a member of the legendary Ruby Braff/George Barnes Quartet, and even coaxed Les Paul out of retirement. We lost Wayne on May 9, 2008, and Nick passed away on July 4, 2008. This CD is dedicated to their memory. If you enjoy the music on this recording at least half as much as we did making it then you may also want the companion CD, She's Makin' Eyes at Me! (GJB 11/20/83), with more great music from those sessions.